We've passed the halfway mark! The weather indicates a bit of a cool down this week, so hopefully we'll all be able to go out and get in a few more comfortable miles! If the weather does in fact stay cooler, try to push yourself to run a little bit longer, or for those of you who haven't made it to the track yet, come out to the track for a good speed workout! The speed workouts will prepare you for a little faster pace on race day! On September 17th we will have a seminar after the run on race day preparation, race day tips and tapering. The groups ran close to or even some more than 10 miles last Saturday - so now you know you can do it! The remaining weeks are about maintaining those miles and working on speed for race day! It should get a little cooler in September (hopefully) which will really make a big difference in your training! The miles will feel so much easier! Week 4 - Smokin' Hot! Despite the heat, everyone appears to be doing great! Keep getting out there and running, even though it's hot. I promise it will pay off when it cools off! This week, the groups ran 70 minutes on the Mount Vernon Trail from Gravelly Point. We'll be meeting at that location again this week, and again at 7:30 due to the forecasted temperatures getting back into the 90s this week! Week Two of the training program was a hot and humid one! Hopefully everyone has been getting out and trying to get acclimated to the weather. That remains the most important part of your training right now - building your "base miles," getting back into a training routine, and coming up with a plan that is going to work for you and fit into your schedule! Drink lots of water and/or elctrolyte replenishing drinks before, during and after you run! See the previous post from Eric regarding the track workouts at Wakefield High School in Arlington. 6:30am this Tuesday! We will be meeting at the Lincoln Memorial this Saturday, July 23rd, 8am. Please contact Kristin at 10Miles@dcroadrunners.org if you have not heard from your coaches, or if you have switched groups! What:Tuesday Morning Track Workout - Beginning Tuesday, July 19th. The focus of this series of workouts is twofold. First is to teach people how to plan and run a track workout and, since there is no better way to learn than by doing, the second focus is to run a track workout. Who:For those who can't make it to the Wednesday night track workouts and/or people who want to learn how to run FAST. When:Every Tuesday morning at 6:30am.I guarantee we will be done with the workout before 7:30am so we can all trudge off to our day jobs. Where:Wakefield High SchoolWakefield HS is on George Mason Drive between Four Mile Run Drive and Route 7 (Leesburg Pike). Address which works for most online mapping is 4700 S Chesterfield Rd, Arlington, VA 22206 (well, it works for Google and Mapquest, don't know about others). If you need a ride, let me know eric_zander@yahoo.com and I'll see what I can do to match people up. Looking forward to seeing lots of bright happy faces on Tuesday! 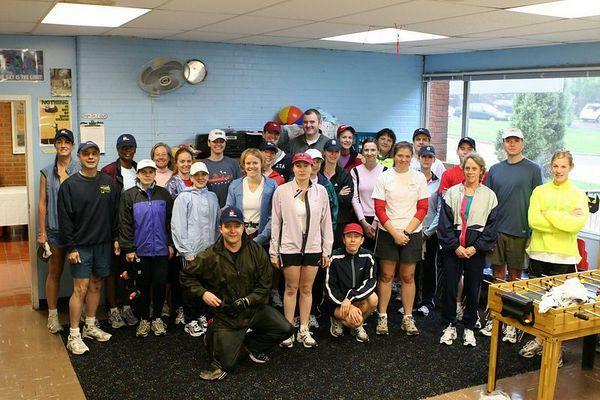 Welcome DCRRC 10 Mile Training Program Participants! This blog will be general pointers, guidelines on training and information on weekend meeting spots. GOAL FOR WEEK ONE: Run! For many of you, this is a transition week - be it a transition from a rest period after the 10K Training Program, another race, or a transition from no formal training. Find the best time of day, the pace you're most comfortable at, and get back into the routine of running. The best way to be successful at any distance is to get out there and run! You should try to run 30-40 minutes at a time, 4-5 days this week. This week there will be no speed workouts. Your coaches will send you specific workouts or be in touch for more information on your weekly goals. POINTERS: Your Saturday long runs should be LONG SLOW RUNS. This is the day that you build up mileage. We'll have other runs during the week where you build up speed. Very generally (there are guidelines for this, but I'm going to generalize), you should be running at least a minute slower than your "race pace" on your long runs. The first couple of weeks should be about building back your base mileage, and not about building up speed. Run at about 80% of your goal effort or less. NEXT WEEK: We will be meeting on Saturday, July 16, at 8am, at the Lincoln Memorial. This will allow for metro commuters, and temperature. Ample parking is available along Ohio Drive. The metro opens at 7am. I recommend metro to Arlington Cemetary and walking across the Memorial Bridge. Email Kristin at 10Miles@dcroadrunners.org if you do not hear from your coaches this week! For those of you from the 10K program, here is a link to some of the photos!